You worms are no match for the dark side. Trained to be dark and evil. This Costume is inspired by Darth Maul from the Star Wars series. With robe, belt and mask included, you too can look just like Darth Maul. Scare everyone with your very own latex headpiece that truly 'tops' off this costume. 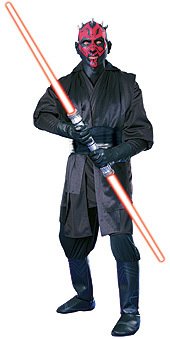 While you're wearing this Star Wars Super Deluxe Darth Maul Costume, don't forget about the dark side.